In November, we announced a preview of Azure Active Directory (AAD) as an identity provider for Mobile Services. The mission was to give enterprise developers an easy solution for building employee-facing mobile apps. Basic authentication is a great start, but in many cases our current preview customers have needed to distinguish between types of users in order to make authorization decisions. Roles-based access control (RBAC) is the idea of assigning permissions to roles that your users can hold, nicely defining boundaries on what certain classes of users can and cannot do. Luckily, it is very easy to add basic RBAC to Azure Mobile Services, and this post will walk you through how to accomplish that. In order to follow along with the rest of this post, you'll need to be enrolled in the Mobile Services preview for Azure Active Directory integration. If you would like access, please email MobileServices@microsoft.com. Let's imagine that I want to develop an application just for my sales team. In order to access the app, a user not only has to be a member of my company’s directory, but also assigned to the sales group. Let’s take a look at the logic you’d need to add on the server-side to ensure that only authenticated members of the sales team can access the app. 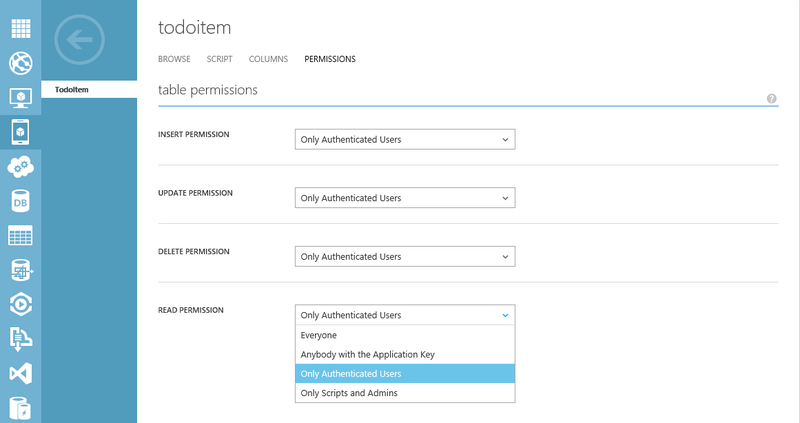 (If you’re just getting started with Azure Active Directory Authentication in Mobile Services, you may find this getting started tutorialhelpful.) 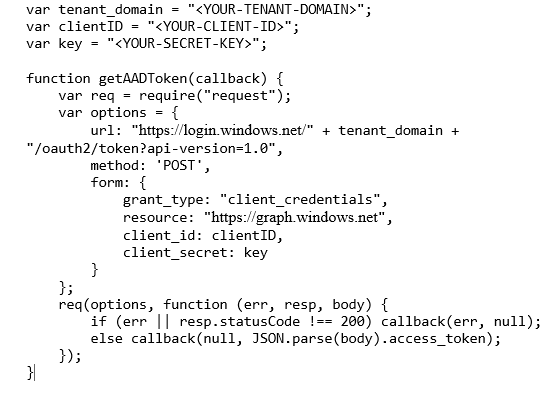 The basic approach we'll be taking is to leverage security group membership for users in our Azure AD tenant. 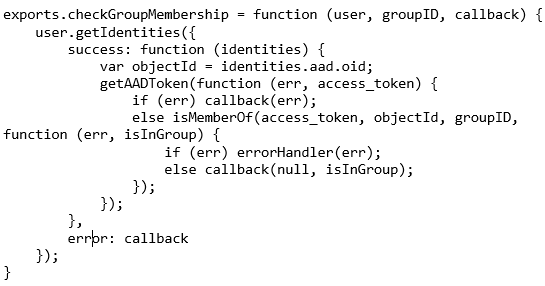 AAD has the concepts of both roles and groups, but in today’s scenario we’re working with an existing group that already has the correct user membership. We'll be managing our group from an on-premises AD tenant that is synced with our Azure AD tenant. 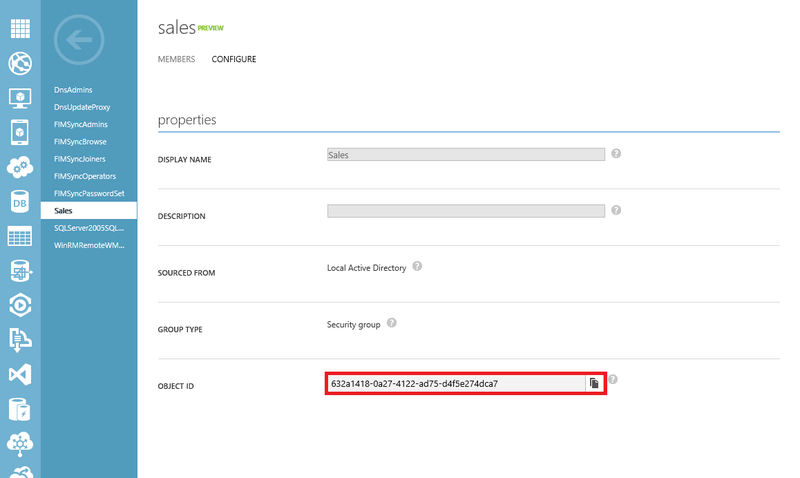 Customers of O365 and Windows Intune can attest that you get a lot of power by setting up a directory sync with on-premises Active Directory (and you can even use those tenants to build Mobile Services). Today, I'm going to be using the "Password Sync" option, but there are multiple scenarios supported. 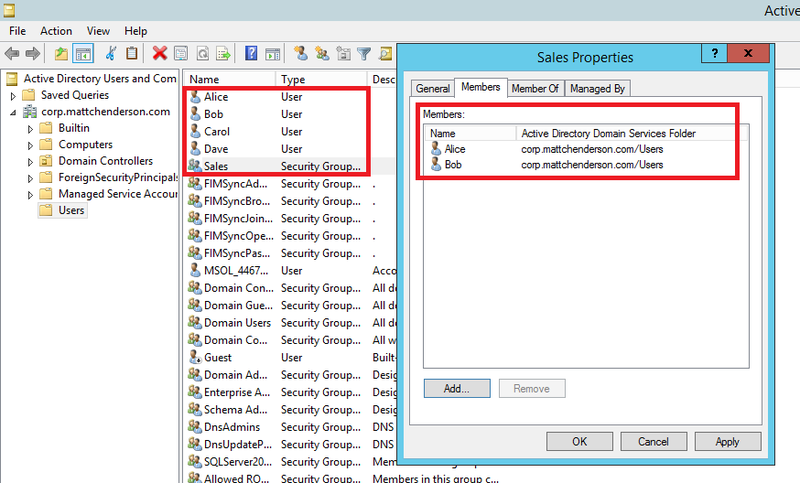 You can actually set up AAD to point to ADFS for a great hybrid scenario. If you want to play with these options, spin up an Azure VM running Windows Server 2012 R2 Datacenter and install the Active Directory Domain Services role. Then follow the directory sync instructions. Within my directory, you can see that I've created some users (Alice, Bob, Carol, and Dave) as well as a “Sales” domain security group. I've made Alice and Bob members of this group, but Carol and Dave remain outside it and should not have access to my app. Everything else is default. And that's it. We've successfully restricted our app usage to the subset of our employees that needs it. From here, you can start building for a variety of RBAC scenarios. If you find that you want to differentiate the client UI for certain users, one simple way to do this is to expose the membership check as a Custom API, which you can invoke immediately after login. Azure Active Directory is doing some cool things with their group support, and a lot can be accomplished straight from the management portal. AAD Premium users should be sure to check out the new self-service group management support. If you are interested in enterprise mobile app development, I encourage you to also check out the new Mobile Services .NET backend preview. It does not currently have built-in AAD support, but don't worry! We will have it available soon. And again, if you're interested in joining the AAD preview or have any questions, please reach out to us at mobileservices@microsoft.com. If there are additional features or scenarios you’d like to see covered, please submit your feedback to our uservoice.